The widely-tracked Nikkei purchasing managers’ index for services fell below the 50-point mark, indicating a fall in activities for the second time in four months in May. This also had repercussions in the job markets as hiring grew the slowest this year in May. 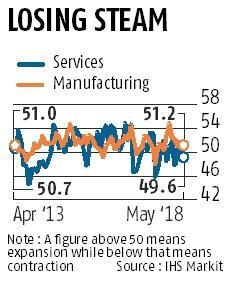 PMI for services fell to 49.6 in May from 51.4 in April as new business orders stagnated and cost pressures intensified. However, a “bright spot” was that business sentiment was the strongest since January 2015, rooted in expectations of improvements in demand conditions in the year ahead. The index had last slipped below the 50-point mark in February. As per the survey, competitive demand conditions and a broad stagnation in new orders were the key factors behind a decline in output across the services sector in May. The index reflected the overall weakness in the services sector, shown in even the GDP data. Within the services sector, only government-backed public administration, defence and other services showed improvement in growth during the fourth quarter of 2017-18 as compared to the third quarter of the year. For instance, the beleaguered financial, real estate and professional services grew by five per cent in Q4 against 6.9 per cent in Q3. Trade, hotels, transport and communication as well as services expanded 6.8 per cent against 8.5 per cent. On the employment front, the slowdown in services activity fed into the labour market, as jobs growth moderated from April’s seven-year high. The headline seasonally adjusted Nikkei India Composite PMI Output Index – that maps both the manufacturing and the services sector – fell from 51.9 in April to 50.4 in May.